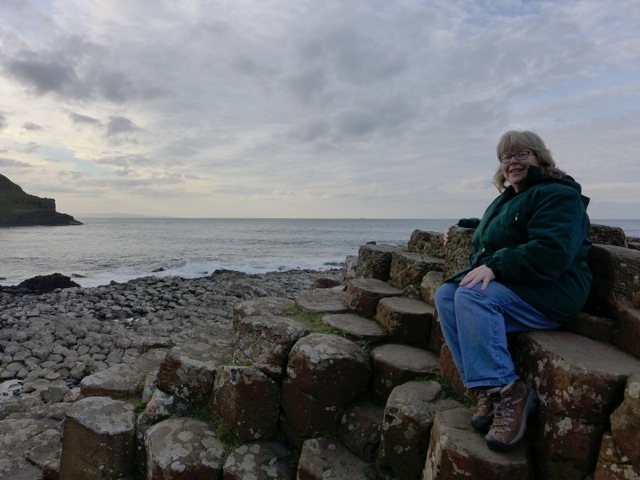 This October I had a chance to mix two of my hobbies, geology and mythology, on the Giant’s Causeway in northern Ireland. 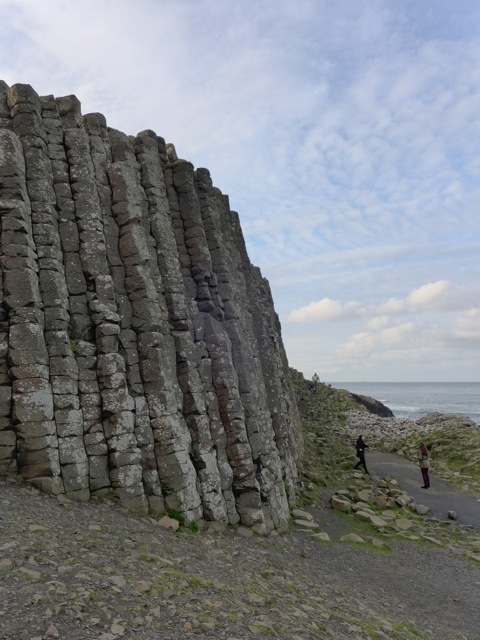 Geologists tell us that the Giant’s Causeway is a beautiful example of columnar basalt, lava that cooled slowly and cracked into enormous columns of four to eight sides. The audio guide provided by the visitor’s centre suggested that part of the reason for this long-term cooling is that the lava flowed into a river valley, so that the surface cooled off, capped and insulated the interior of the flow for an unusually long time. 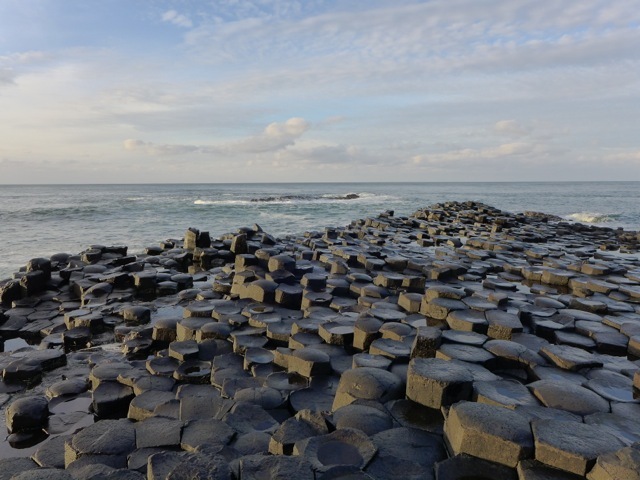 The formation is 60-50 million years old, created during the enormous lava eruptions that heralded the opening of the Atlantic Ocean. As usual, traditional mythology attempted to explain the natural world through stories, the easiest way to explain things prior to the invention of the scientific method for testing and verifying hypotheses. And as so often, a local folk hero was given credit for distinctive landforms. However, Finn MacCool (Fionn mac Cumhaill) was not the bravest hero in this myth— in fact, that honor goes to his wife! Finn had a rival over in Scotland, the giant Benandonner, the Red Man. (From Ireland’s northeast coast, Scotland can be glimpsed across the North Channel less than 20 miles away). Finn scooped up a clod of earth and flung it at Benandonner, but his throw felt short: it landed in the Irish Sea as the Isle of Man. 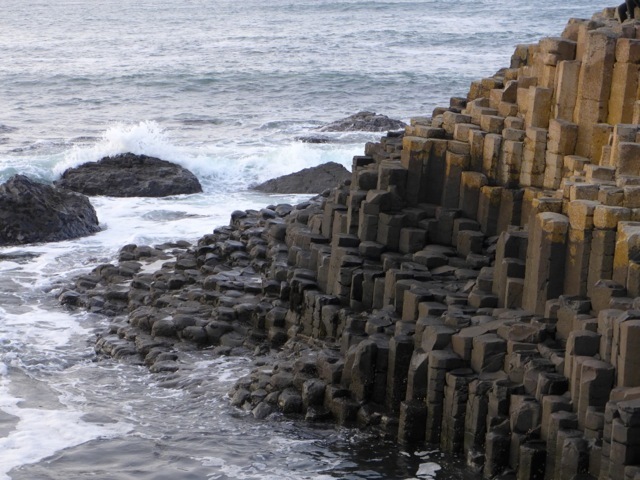 Benandonner was shouting back equally rude insults, so Finn started to build the Giant’s Causeway across the strait to have it out with his loutish foe. It seems that Benandonner was building a bridge out to meet him, since the other end of the Causeway surfaces on the Island of Staffa in the Hebrides. As Finn drew close enough to get a clear look at his enemy, he realized just how enormous the giant actually was. Having second thoughts about battling him, Finn heroically turned tail and ran all the way home. In a panic, he explained to his wife that he had a giant on his tail. Benandonner was coming. Finn’s wife, Oona, quickly hatched a plan. She hid Finn in the baby’s cradle (we’re not quite sure where the baby was) and baked an enormous bannock with rocks in it. When Benandonner arrived, she invited him in and explained that her husband wasn’t home yet. She offered to feed the giant her husband’s favorite griddle cake while he waited. He broke his teeth on the boulders inside and was suitably intimidated. He was even more aghast when Finn, disguised as a baby, began to howl and squirm. When Oona identified Finn as Finn Junior, Benandonner decided he’d had enough: if that was the size of Finn’s baby, he wasn’t going to hang around to fight the father. Benandonner ran all the way back to Scotland, ripping up the Causeway behind him to keep Finn from following. Below: Finn MacCool’s “house” in the distanc, with his thin “chimney” sticking up above the headland. 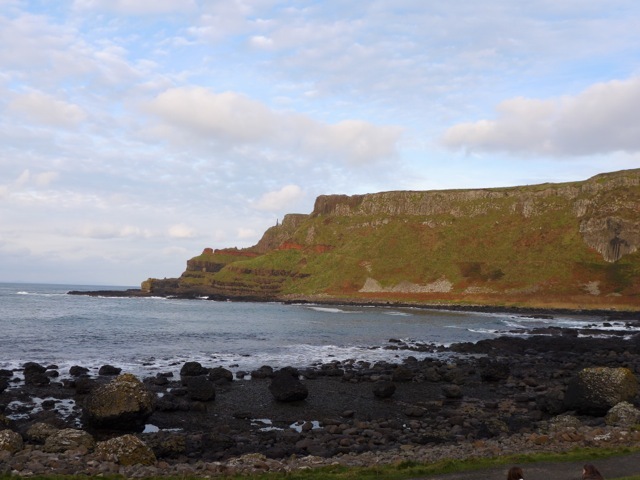 The inland edge of the Giant’s Causeway is in the foreground.